FINCH, Ontario — If the approval signed by the Wynne government for the Nation Rise wind power project were a bird, it probably wouldn’t be able to fly, because it is so weighted down with conditions. One of those conditions was that the power developer, EDP of Spain, identify and map all water wells in the project area near the proposed wind turbines, because of concerns about the construction activities on the local aquifer. That hasn’t happened, say residents. 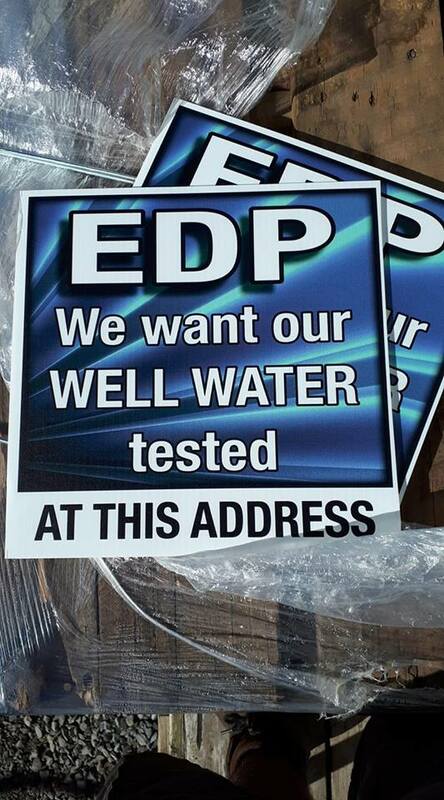 Now, signs are popping up all over the country roads and in the communities of North Stormont, as part of an information campaign about risk to the local water supply, and to demand that wells be identified and tested by the developer. Residents are concerned about the impact of vibration from pending wind turbine construction and turbine operations on their water wells. The “Nation Rise” wind power project is currently under appeal, but the power developer is supposed to be proceeding with meeting the terms and conditions of its contract with the Ontario government, which was approved just days before the June election. The problem is, EDP’s count of the number of water wells that need identification and testing does not correspond to the summary of the situation in the Renewable Energy Approval or REA. As a result, wells may be missed in the pre-construction survey and then be ineligible for help should problems arise after the power project is built. According to Margaret Benke, spokesperson for Concerned Citizens of North Stormont, the power developer may be off by as much as 50 per cent of area wells. People are worried, Benke says, for several reasons: a wind power project in the Chatham-Kent area is linked to disrupted function and outright failure of as many as 10 percent of area wells, resulting in contaminated “black” water. The situation is so dire that the new Ontario government has pledged an investigation of the situation. The appeal resumes October 15th in Finch Ontario, with testimony from an expert in hydrogeology. This is why you can’t allow the wind company to look after your best interests- they won’t. Protect yourselves by getting your own tests done. Turbines must be stopped immediately. Evidence of past and ongoing health harm has been reported in Huron County and elsewhere. Hey Richard, no fun in stopping them let’s speed them up! Release the brakes and watch them go! It will also make taxpayers some money. We will charge Liberal voters to attend the catastrophe. Yes, they are that stupid. They can also get as close as they want with no extra charge. I have put out a challenge for many years to anyone anywhere who can show me an electrical benefit from Industrial Wind Turbines? It was all hype and stakeholder promotion. Don’t get me started on Denmark! An idiot and his money are easily separated! A landowner with greed is an easy mark! Better luck next time you poor fools! Corporations, in alliance with governments, have been doing this to our Indigenous people and are now doing it to rural residents and even to fourth generation farmers in our prime agricultural county in Ontario. When will this evil, forced relocation agenda which is actually a manifestation of systemic genocidal ideology directed at innocent men, women and children in rural Ontario, end? The parallels to the industrial scale wind turbine incursion in rural Ontario are striking. Why is the work of Dr. Mariana Alves-Pereira, in exposing the irreversible harm to the neurological as well as the vestibular system, being ignored by the WHO? In Ontario, we now have four rural residents, willing to have their relevant medical records viewed by our new Health Minister, Christine Elliot, so she can see that the frightening cardiac instability that caused them to be subjected to medical investigations, is proof that they did not have typical causative factors. These people all have turbines too close to their homes. The turbines are still running. Why has she not responded to this information? Is she waiting for the WHO to direct her? Why have the doctors, who did these investigations, not spoken out? How many other people are in similar circumstances? How many other innocent residents in rural Ontario are in various stages of the cumulative harm from LFN and infrasound radiation? Has anyone ever investigated Coroner’s Records in communities where these turbines have been sited too close to homes? Why did Dr. Mariana Alves-Pereira state publicly that she would not live within 20 km of an industrial wind turbine? If she said this; knowing what she knows, why should anyone have to live within 20 km of an industrial wind turbine? Why are these turbines still harming innocent men, women and children? Is this a forced relocation agenda? Is this evidence of ‘genocidal ideology’ directed at rural communities? Who will be held legally liable for this harm?